From our island-hopping activity, we proceeded to Cloud 9 around 6PM to drop-off our new Taiwanese friend and check out food options for dinner. I was expecting a vibrant night life comparable to that of Boracay since this is a popular surfing turf, but I was surprised that the shore was free from crowded establishments. The only thing loud is the sound of the waves. 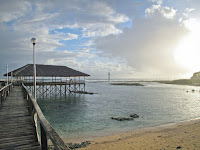 Visiting the Surfing Capital of the Philippines in December is a quiet escape from the holiday bustle. 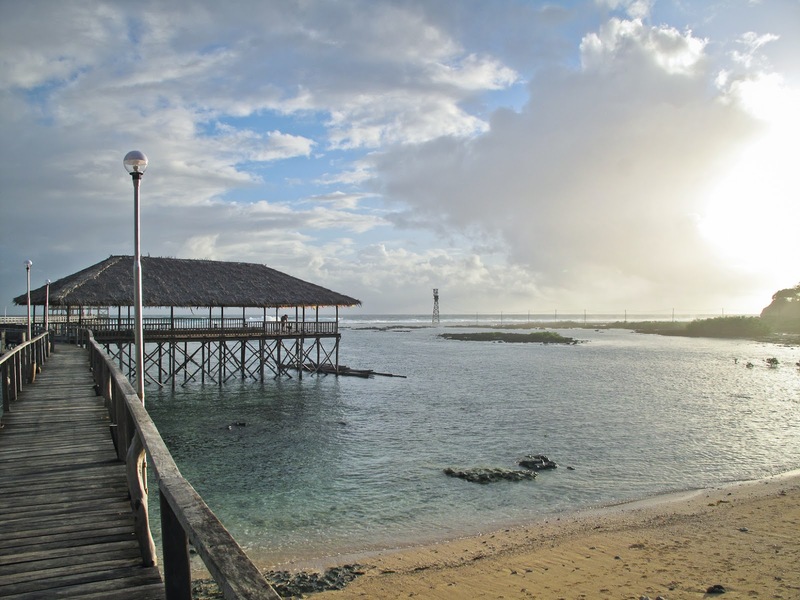 Think of the usual province where there's coconut trees, sand, and occasional houses, then somewhere in this setting, add gigantic waves and killer reef breaks! We decided to go back on our last day to see the famous Cloud 9 before the sunrise. 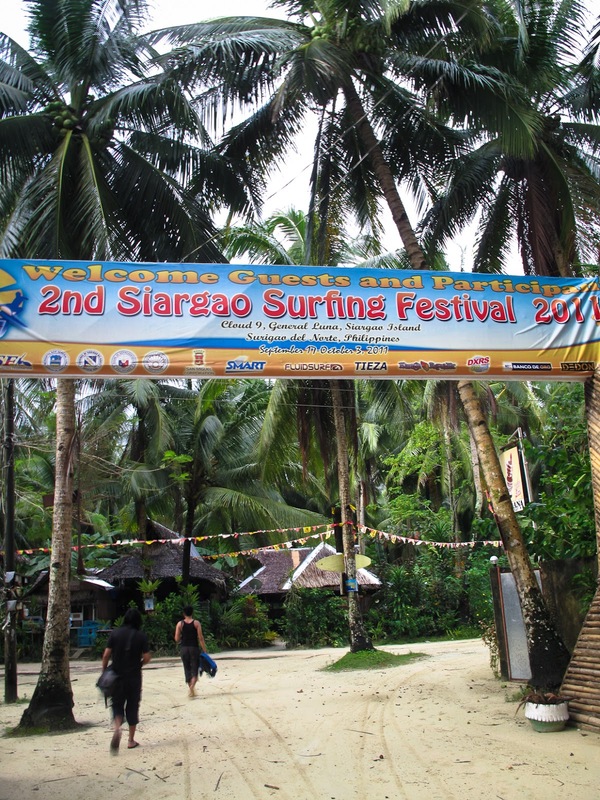 I have tried surfing in La Union before and for some reason I thought that I could do it again in Siargao. Who am I kidding? Though calmer in the morning, Cloud 9 waves are definitely not for beginners, especially not for those who doubt their swimming skills. 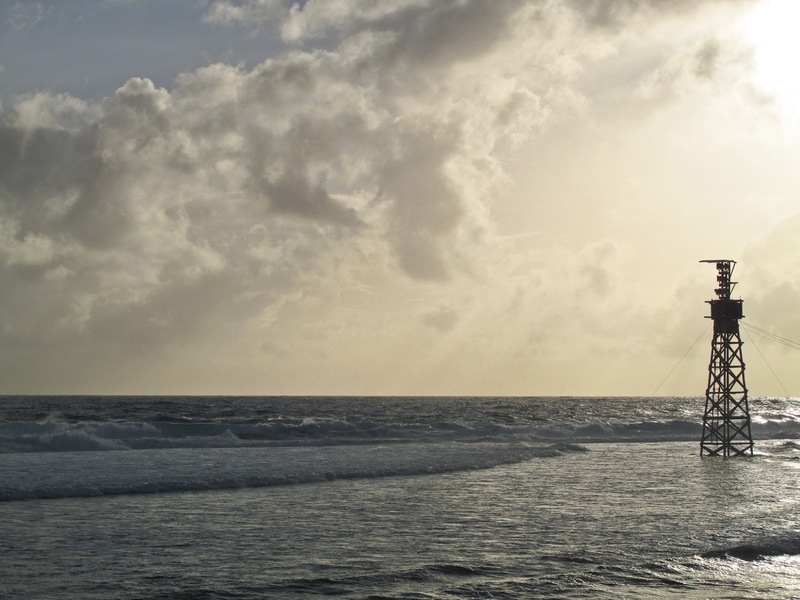 The area transforms during competitions, when surfers and enthusiasts all around the globe flock to the small island. The long boardwalk and the 3-story viewing deck is packed and people normally pitch their tents wherever possible. We wanted to see surfers in action, but apparently, the early morning swells were not huge enough for riding. We watched these two boys walk away with their boards. 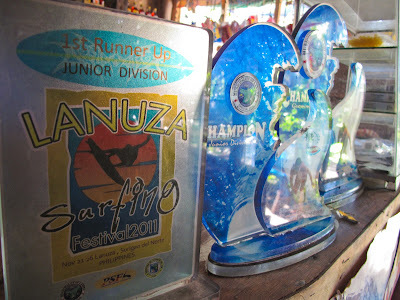 We ate at the small restaurant nearby and learned that those boys are the proud recipients of these Surfing Festival awards. It is a good thing to know that the locals themselves take part in the competitions, and some of them take surfing as a way of life. Aside from Cloud 9, we also visited the Magpupungko Tidal Flats (the first I've ever seen!). I wish I took good photos but unfortunately, it was raining hard that day. The tidal flats can only be seen during low tide. 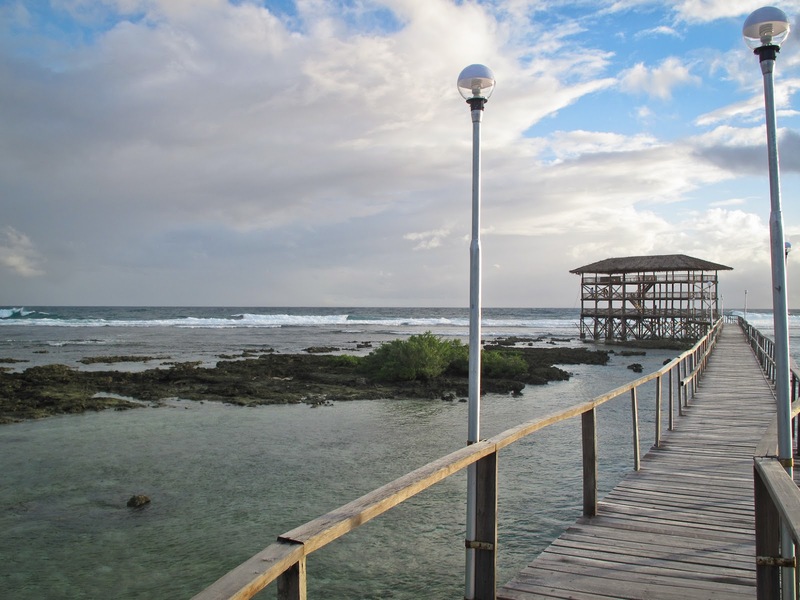 Do trust me when I say that it is one of the must-see places in Siargao. Check out Eazytraveler's photos here for proof. We went around 8 out of the 9 municipalities of the island in 4 hours, while riding our reliable mode of transportation, the habal-habal. My back and leg was aching by the time we got back to the hostel, but a sumptuous dinner at De Colores Restaurant in Dapa cured me of my soreness. PS: There's one thing I've discovered about myself on this trip: I can fall asleep while riding a speeding habal-habal. This post is part of the Surigao del Norte year-ender trip. For the nitty-gritty of this trip, visit Eazytraveler's posts.